Finally the 2nd Anniversary passed and surely, no more updates from now about this year's Anniversary Celebration. Didn't really expect that this year's anniversary's items would be that expensive. We thought the prize would be just like last year, anniversary items in cheap prizes! So here's the review between the 1st and 2nd Anniversary. [1st Anniv. Event] 3/8 Discount Black Tiger!! [1st Anniv. Event] Happy Oliver Campaign!! 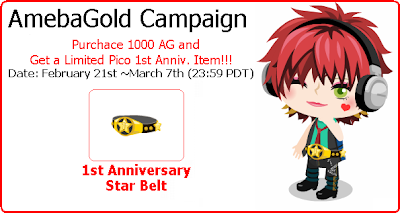 Giving Away Ameba Gold for Three Days! [1st Anniv Event] 2/24~3/3 Recycling Campaign!! Another Discount time! Recycle your items for 50 Gummies! [1st Anniv Event] Sweet & Yummy! 1st Anniversary Park!! [Quest] Be a NINJA!! Come to Jokamachi! [1st Anniv Event] Anniversary Limited Items!!! [1st Aniv Event] NY Downtown in Celebration! 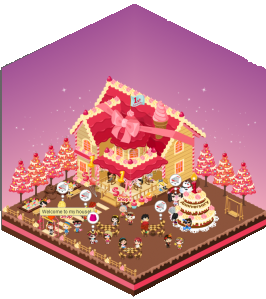 [1st Aniv Event] Chloe’s House is Now Decorated!! [WIGS] New Party Wigs Available!!!! [SLOT] 2nd Anniversary Festival Challenge! See? The 2nd Anniversary is like more on about money. For them to earn money. To make their users buy Ameba Gold for their are calling "Limited Items". Things was better in 1st Anniversary than 2nd, which was really disappointing :/ They sell premium items (AG Items) intead of gummies like a SUPER SALE but they didnt :( Yeah, they do give 5x, 10x, 12x but those challenges are really hard than the past ones, still for their users to buy stones and perfumes for their so called getting-the-items-easier. I think what they did in 2nd Anniversary wasn't really enough to be better for the celebration last year. Tokens, gummies are really useless now.